It’s likely that members of your own library staff aren’t aware of virtual reference, let alone John and Jane Public. So how can you raise awareness? By marketing, of course; but effective marketing is more than splashy promotions, eye-catching graphics and clever messages. Success is grounded in constant attention, creativity, listening to customers, and being passionate about all that libraries have to offer. Join OCLC Western libraries and others for this two-hour online workshop presented by Buff Hirko, former Statewide Virtual Reference Coordinator for the Washington State Library and co-author (with Mary Ross) of Virtual Reference Training: The Complete Guide to Providing Anytime, Anywhere Answers. Two sessions are being offered, May 13th and June 5th. This course will introduce concepts and techniques that tempt folks to use your chat service, and keep them coming back. In addition to basic marketing guidelines, we will also discuss examples of creative promotion, cost-effective tools, and design principles and resources. It is a perfect course for chat service providers and managers from academic and public libraries who want to increase their visibility and understanding of virtual reference. We will have a maintenance install this Sunday, April 27, at 3:00 a.m. Eastern Time, 0700 GMT. We expect the service to be available again within 15 minutes. Below is a list of apparent changes, with descriptions. Please be sure to end all active chat sessions before the system is brought down; check your New list when service is restored for any interrupted chat sessions or unanswered email questions. If you experience any outage after the projected downtime, please contact your customer service provider for assistance. Here are the user-apparent changes you can expect to see following the install planned for Sunday morning, April 27. Watch the list and the My QuestionPoint home page announcements for exact install time. 1. We have fixed the problem that allowed patrons to send across the less-than character ( < ) in their question or chat text, thereby inadvertently hiding all text that followed the special character. The character is now filtered and rendered in such a way that it no longer hides the text that follows. 2. Patrons of libraries that have enabled Captcha for their hosted e-mail web forms see the following page after submitting their questions. They must enter the letters they see there for their question transaction to continue. With this release we have added wording that explains why this is necessary (“To help us prevent spam, please type the characters you see in this picture”), as well as icons to the right, which enable the patron to choose another picture for the test, to hear the letters read aloud, or to get Help. 3. 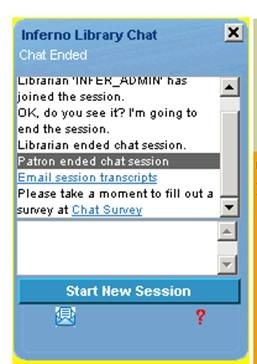 If your administrator has indicated that chat users are to receive a survey request, a link to the survey will now appear in the Qwidget window, as well as in the e-mailed transcript. 5. Administrators will notice that an “Admin” quick link is back by popular demand! A link at the bottom of the left-hand navigation bar will allow administrators to jump directly into the Administration module. 27 avril 2008: Veuillez prendre note que le service QuestionPoint ne sera pas disponible de _0700 TU à __0715 TU, le temps d’une installation d’entretien du service. Veuillez vous assurer de mettre fin à toutes vos sessions de CHAT actives avant l’interruption afin d’éviter que la communication avec vos utilisateurs ne soit coupée. Lorsque le service sera rétabli, vérifiez dans vos listes de “Nouvelles” questions pour les sessions de CHAT interrompues ou les nouvelles questions par courriel. Si vous avez des problèmes après le retour du service, n’hésitez pas à contacter votre fournisseur d’assistance technique. Nous nous excusons de cette interruption. Voici les modifications apparentes que vous pourrez voir après l’installation prévue dimanche matin le 27 avril. Consultez la liste et les annonces dans l’écran Mon QuestionPoint pour l’heure exacte de l’installation. Nous avons réglé le problème qui permettait aux utilisateurs d’envoyer le symbole moins que ( < ) dans leur question ou leur texte de Chat, et qui cachait tout le texte qui suivait ce symbole. Ce symbole sera maintenant filtré et généré de façon à ce que le texte qui suit ne soit plus caché. Les utilisateurs des bibliothèques qui ont activé Captcha pour les formulaires de questions par courriel qu’elles hébergent voient l’écran suivant après avoir envoyé leur question. Ils doivent inscrire les lettres affichées dans cet écran pour poursuivre l’envoi de la question. Nous avons ajouté des explications indiquant pourquoi l’entrée de ces lettres est nécessaire (« Pour nous aider à contrer les pourriels, veuillez inscrire les caractères que vous voyez dans cette image »), de même que des icônes dans la droite qui permettent à l’utilisateur de choisir une autre image, d’écouter la prononciation des lettres affichées ou d’obtenir de l’aide. Si votre administrateur a choisi qu’une demande de sondage apparaisse aux utilisateurs du Chat, un lien à ce sondage apparaîtra dans la fenêtre du Qwidget ainsi que dans la transcription de Chat envoyée par courriel. Les administrateurs des bibliothèques qui offrent le Qwidget comme option de contact aux utilisateurs verront les statistiques d’utilisation qui apparaîtront sur une ligne dans la partie Chat des rapports de statistiques sur les activités. Les administrateurs remarqueront que le lien rapide « Admin » est de retour à la demande populaire! Un lien dans le bas du menu de gauche permettra aux administrateurs d’aller directement dans le module Administration. Begin the conversation by asking the student a question about the topic. Find out the details of the student’s assignment (Is it a worksheet? A paper? How many pages? How many sources does the teacher require? Are certain types of sources required?). Decide whether the student is asking one question that requires a specific answer or if the student has several questions about a topic. If the question requires a specific answer, send a web page and explain why you are sending the page (i.e. “This page has info about photosynthesis. Take a look at the fifth paragraph and tell me if that information answers your question.”). Note: Sometimes when a librarian sends a page to the student, the student immediately responds, “Just give me the answer.” The librarian’s phrasing above anticipates this response and gets the student involved in the conversation. If the student has several questions relating to a general topic or seems to need general resources about the topic, recommend an almanac or encyclopedia suitable for homework assignments. · Textbooks’ websites often offer supplemental information and guides to help students. · And don't forget about Credo Reference, found under the "Cooperative Resources" link on your My QuestionPoint homepage! Instead of saying “We cannot do homework for you,” focus on what you will do for the student. Take advantage of this teachable moment by explaining how to navigate through a database or website, how to choose effective search terms, and how to evaluate a resource for authoritativeness and relevancy. In the transcript below, it would have been useful if the librarian had asked additional questions, offered several resources, and guided the patron to specific paragraphs instead of repeatedly suggesting that the student talk to the teacher instead. Librarian: Hi <patron’s name>, so you want to know how oil separates from water. Where have you looked so far? Librarian: Are you still there? Librarian: Is this for homework? Do you know how to look up stuff on the internet? Librarian: When you do research, try going into Google. I did the keywords of "oil separate water" and found this site http://en.allexperts.com/q/Chemicals-2460/oil-water-separate.htm If this doesn't work, given that you have the study guide, you should have all the answers you need in your text book. Librarian: If this doesn't help, you may want to talk with your teacher to help you find what you need. Librarian: We can guide you in your search and make referrals to other sources of information. We cannot answer your homework question for you. I recommended some resources to help you find, or think about, the answers to your assignment. Librarian: Then you will need to talk with your teacher for further explanation. Librarian: Again, we can guide you to a site which answers your question. We cannot explain the information contained within the site. 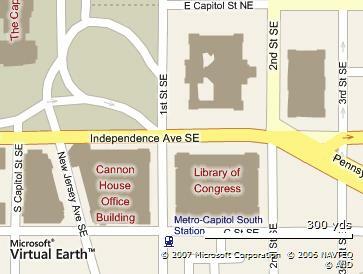 Librarian: It seems we are at an impasse. Feel free to disconnect. Maybe you can find a teacher-librarian who knows of an easier page you can do research from. Librarian: At this point, it seems you still want me to do your homework. Questionpoint is here to guide you. I have made suggestions. At this point I am signing off to help others. Again, I recommend you speak to your teacher directly about your homework questions. Please join us for an update on current product enhancements and a chance to share your experiences and success stories with others. Setup and Support - suggestions based on individual experience about what worked for them and what "we" (AMIGOS/OCLC) could do differently? Users group meeting is free. When a patron says, “Just give me the answer,” a librarian might assume that the patron is a student doing a homework assignment. However, that is not necessarily the case! It is important to begin each reference conversation by asking the patron at least one question--preferably more--about the topic. Below are two transcripts: the first is an actual session where the patron left negative survey comments. The second is an example of how the session could have been improved if the librarian had started the reference conversation by asking a question at the beginning of the session. Patron: How old do you have to be to have a job in Pennsylvania? Patron: what age does it say you have to be to work? Librarian: You can open the link and read the law. Librarian: Librarian's are here to assist with your research, not do your homework for you. Librarian: I have confidence in you to read two paragraphs. I have faith in you. You can do it! Patron: Patron ended chat session. I use this service all the time and this was by far the worst helper I ever had. I was trying to find out how old my son has to be to begin working and the person wouldn't tell me. She told me something about not doing homework for me. This isn't homework. I'll give this service another try, but I hope I don't ever get this helper again. Librarian: Any particular kind of job? [librarian starts searching for the child labor law in PA]. Patron: No, I’m just trying to find out how old my son has to be before he can start working. Librarian: I see. Here is the text of the Child Labor Law in Pennsylvania--please take a look at this and tell me if it is useful to you. Patron: Uh, this looks kind of complicated. Librarian: Okay, this page might be helpful. It has a summary and a powerpoint slide presentation to help you understand the law. It looks like the age can vary depending on the type of job. Patron: The summary is helpful. I don’t have powerpoint, though. Librarian: That’s okay--you can click on the “html” link to view the presentation slide-by-slide without the powerpoint software, or you can click on that red square button to download the powerpoint viewer for free. Patron: Thanks, I clicked the html link. This is just what I needed! Librarian: Great! Can I help you with anything else? Patron: Not now--thanks a lot! Librarian: Thank you for using our service. If you have any other questions, please contact us again. Goodbye! Please post your comments here, or email [email protected] if you have questions about these Tips or any of the Cooperative policies. groups who use your library's QP service. enthusiastic about using QP (insider tips). market/promote the service with little to no budget. Users group meeting is free but RSVP’s are requested. Please respond to Holly Kerwin at [email protected] or 202-707-4854. 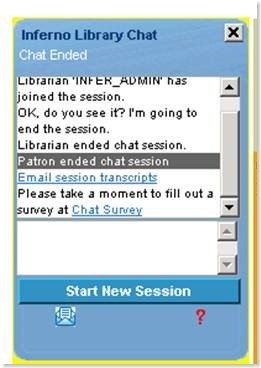 Sometimes a local question may be difficult to answer, especially if the librarian is located in another state. Patron: what is the current amount that is approved for travel reimbursement for XYZ[acronym changed] employees? Patron: Is this an appropriate question for this service? Patron: I can redirect the question to my HR office. Librarian: Yes, please. Sorry, but I'm in [another state]! When you pick up a patron, you can find out some information by looking at the Patron Location Information tab in the chat monitor. You should scroll down in order to view all of the information provided (patron's email address, the library where the patron accessed QuestionPoint chat, the patron's preferred library to use). Students may indicate which campus they attend, and in a statewide service, the patron may indicate the closest city or county. This information supplements the Policy Page: a student may enter from a statewide portal, such that the state’s generic policy page appears, but the Patron Information may give more specific geographic information. The clues found in the Patron Information tab and Policy Page will give you an idea of where the patron is likely coming from, but verifying this as part of the reference interview will help pinpoint the locality, if relevant. In the example session above, the patron asked about a specific acronym, arguably relating to a state agency. The librarian could start by verifying what the acronym means, then seeing if there is any information to be found (in the case of a state agency, some information is likely to be on the web). And, if the information is simply too local and not easily retrievable from a web search, then Follow Up is always an option. Let the patron know someone can respond via email, verify the patron’s email address, and use the Follow Up by Patron Library resolution code. This option enables you to provide good service to Cooperative patrons wherever they may be, even if you aren’t able to immediately provide a specific answer to the question. Please post your comments here, or email me (Susan McGlamery, [email protected]) if you have questions about the Cooperative policies.